It was a bitterly cold day here in Pyeongtaek-Si, hitting a high of 17 degrees with a windchill factor of ridiculous, and original plans to go into town got the kaibosh once my co-workers and I had spent, oh, about three minutes outside. I did get some grocery shopping done, but for the most part it was a day of nesting and crafting and reading up on things to do in Seoul, where I head tomorrow come hell or frostbite. I finished my latest knitted creation this morning, and not a moment too soon. This slouchy beret is super warm and long enough to cover my ears entirely, which is a major blessing in this kind of weather. I think it looks rather smart! And now, for today’s crafty tutorial: a souvenir notebook for jotting down phrases, directions, and whatever else I want to have with me on weekend daytrips. 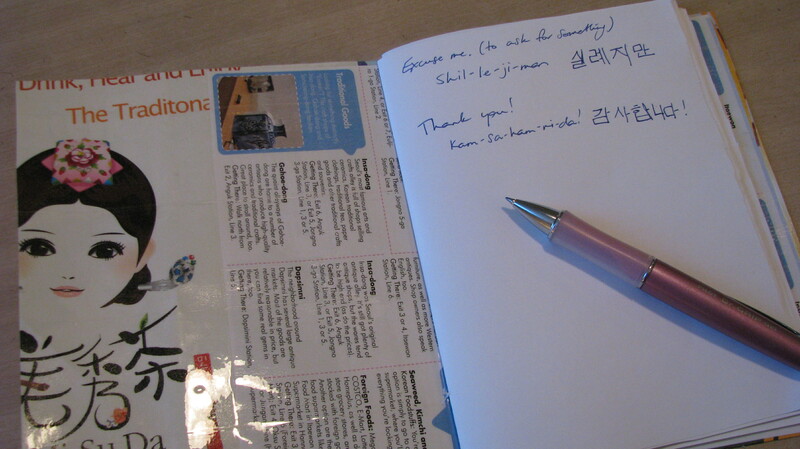 It also serves as a nice souvenir of my trip – much more than a simple notepad. 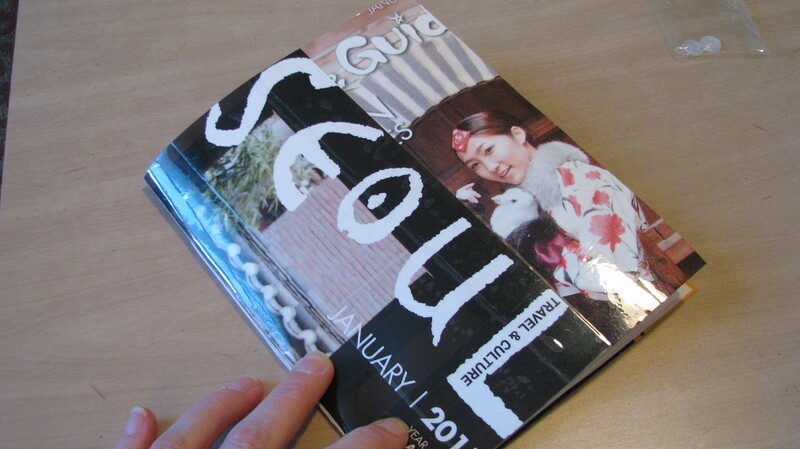 To make your own souvenir notebook, find some tourist publications and pull out a few pages that you like. I used the cover, but if I had folded it in half the girl would have been cut off at the chest so I added a bit of a different publication cover to make it big enough. 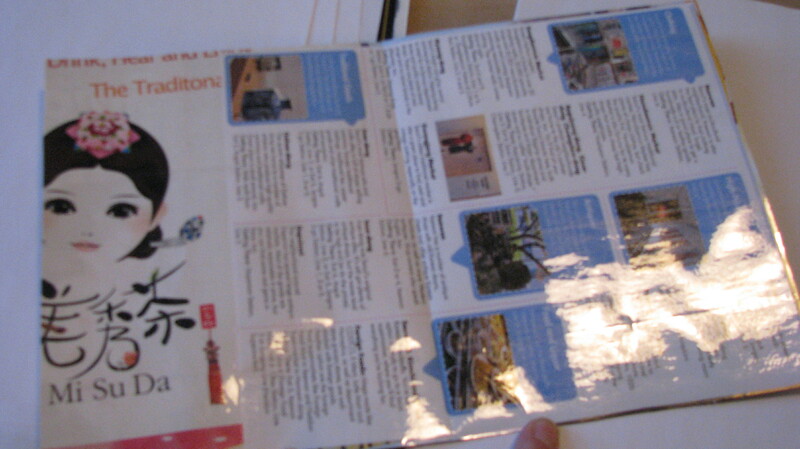 On the inside cover I placed a page of shopping listings – the blocks of text and photos make a nice contrast to the rest of the cover, and make for a nice reference. Play with what you have, and don’t be afraid to improvise. It makes for a more interesting end-product, I think! Put your cover pieces together and secure with either clear contact paper, if you have it, or clear packing tape in strips across the papers. This secures the pieces together and creates a strong, waterproof cover. Trim the edges, making sure that you leave a tiny border of tape to keep all the pieces together. Using a straight edge and a bone folder or other sharp object (I used the edge of a book and a knitting needle), fold the cover in half: first fold it in half and pinch the center to create a crease. Open flat, place the straight edge along the crease, and run bone folder along straight edge using pressure to score a line in the cover. 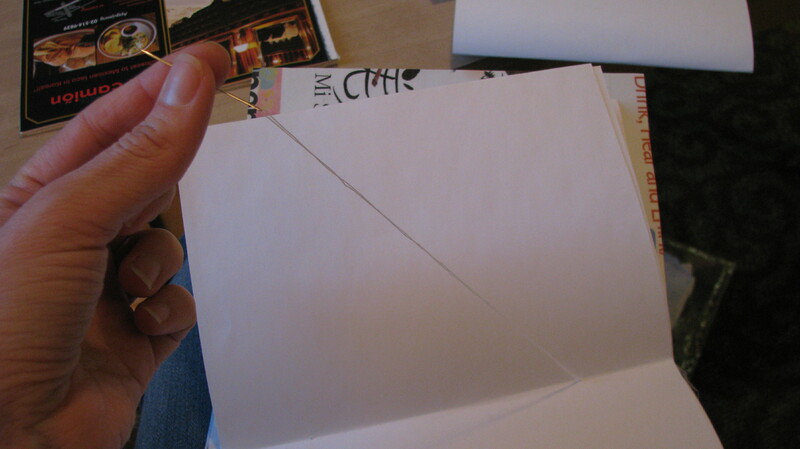 Fold the cover again and press the folded edge to create a clean, sharp fold. 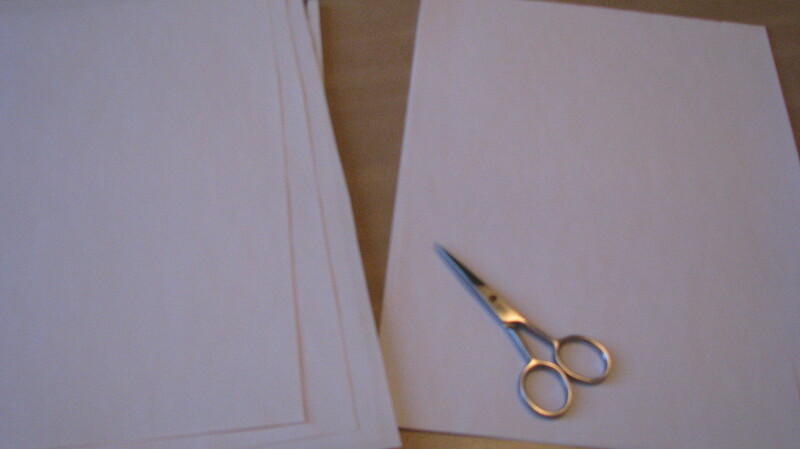 Measure and cut about 10 sheets of plain printer paper to fit inside the cover. Fold each sheet neatly in half as you did the cover. 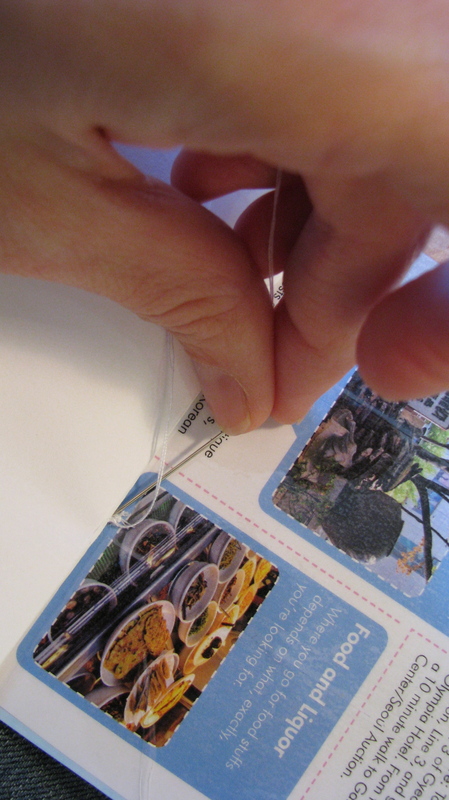 Using needle and doubled thread, make two holes in the crease of the cover, and each of the inside pages. Visually cutting the crease into four parts, the holes should land about 1/4 and 3/4 across. 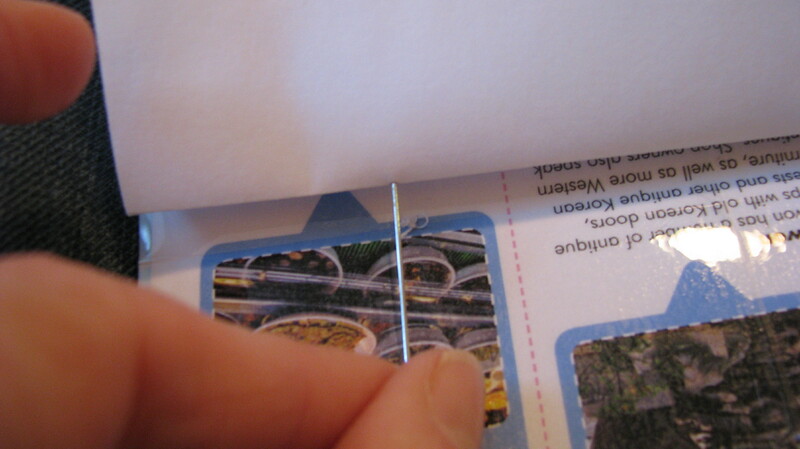 Secure pages to cover: Start thread inside the cover, to hide the knot at the end of the thread. Pull through on outside, then thread through other hole going inside. Thread each piece of inside paper so they stack on top of one another. Bring thread across crease of center piece of inside paper, then thread through all second holes of inside paper, and out through first hole of cover (where knot should be). Run needle and thread through a few more times to create a strong spine for the notebook. Tie off thread on inside of cover, to hide the knot. Lay finished notebook under a heavier book for a few hours to set the creases. Voila! Turns out that I like both sides of the cover so much, I’m going to make it a two-way book: one way will read vertically and give me free space to write, and the other side will be horizontally oriented (like the beautiful girl) and I can paste maps, pictures, whatever. I like it! 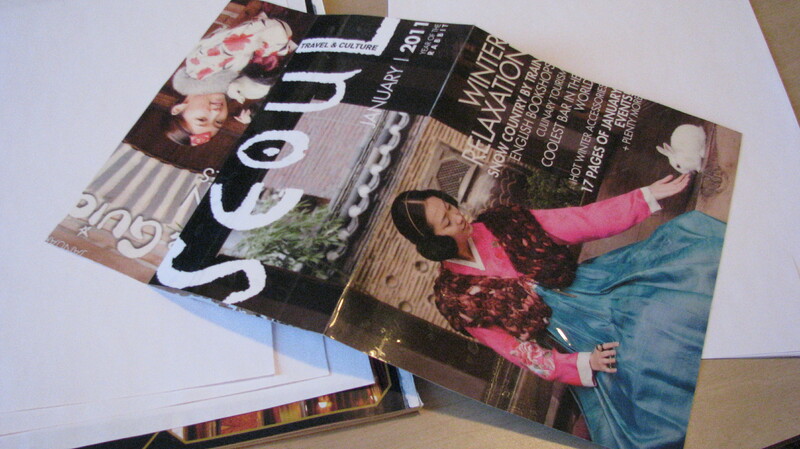 Look for tomorrow’s post on my first sojourn into Seoul: the popular Samcheong-dong (“dong” means neighborhood), where I might attend a meditation session at the Anguk Zen Center, take in the traditional buildings at the Bukchon Hanok Village, do a little Korean ceramics shopping, or try some patjuk (red bean porridge) at the Second Best in Seoul. Yep, that’s the name of the place. It’s all interesting, and with a balmy high of 19 degrees, anything’s possible! Amazing. On several levels. 🙂 Great post. Love you! Stay warm! 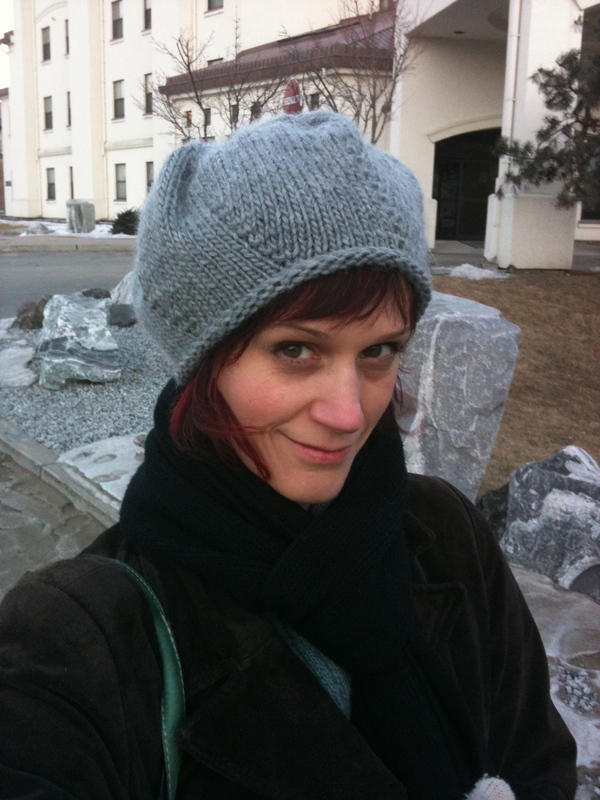 Amazingly cute photo of you in your slouchy beret. Love the beret! Very cute. 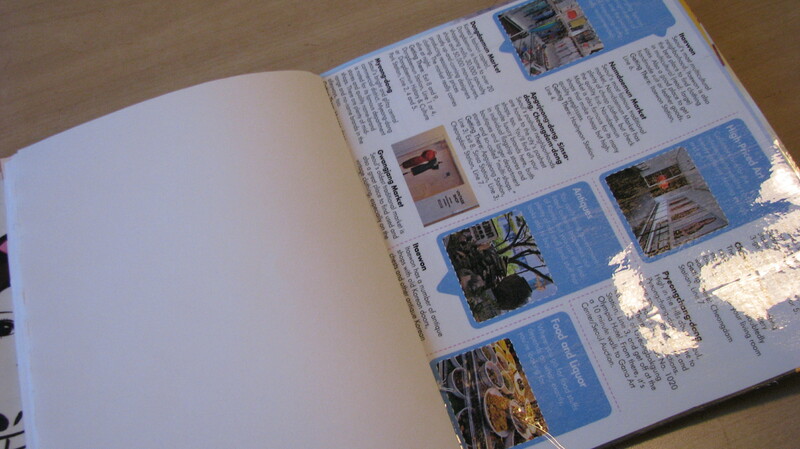 The notebook is a cute idea and just the sort of crafty article you could sell to magazines! Think about it. Love the beret, Maggie! I especially like the converging lines where the decreases take place. 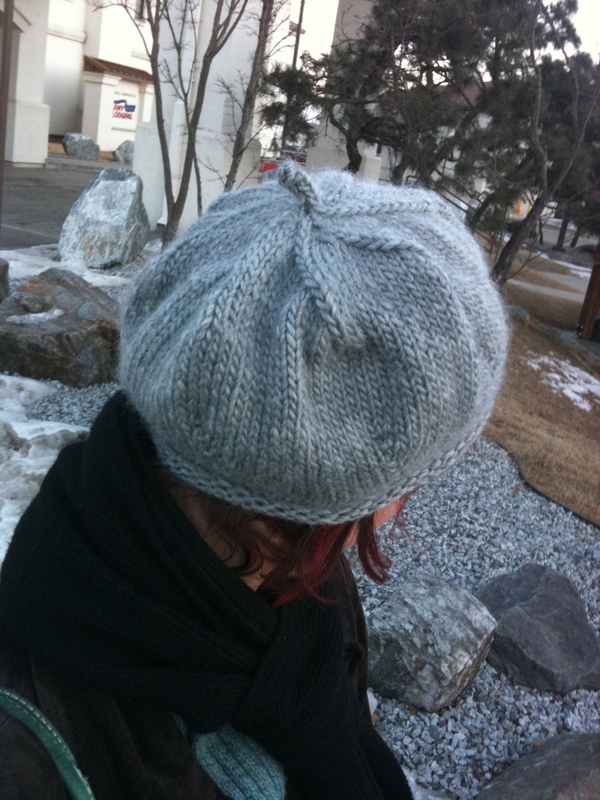 Did you use a pattern, OR are you going to write one so the rest of us can keep our ears warm? Have a good trip to Seoul. How cool! Good for you. LOVE your beret!! You make it and wear it well.